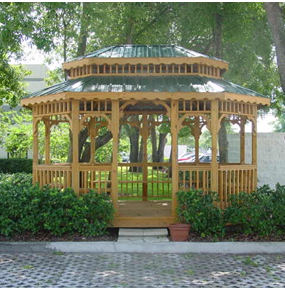 "We offer only top quality products and our gazebos are no exception. 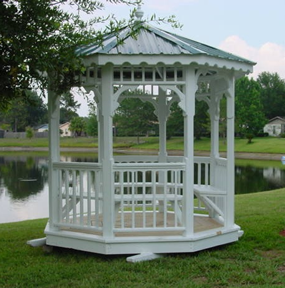 Our gazebo workmanship is second to none!" - Are made with pressure treated lumber. - Are assembled by pre-drilling & screwing pieces together (not air-nailed). - Have the option of being stained, painted or bare wood. - Have the optioin of cedar shake roof, asphalt shingle roof or colored galvanized steel roof. All prices include deliver and set-up within 20 miles of the sales lot. 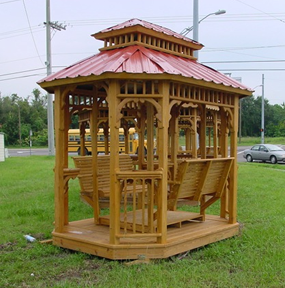 Delivery site must be accessible by truck and have at least two foot more clearance than the width of the gazebo (example: a 10x10 gazebo needs 12 foot clearance to install). Height clearance needs to be approximately 14 foot for delivery. Ground must be level prior to delivery (within 6 inches per length of gazebo). Prices do not include sales tax or any state and local building fees, if required. Langston's Utility Buildings reserves the right to add an additional $25.00 for fuel surcharge. Langston's is not responsible for any permits or set backs, if required. If you have any questions, feel free to contact us. Thank you!